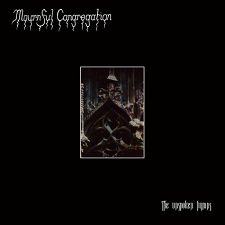 Of all of the bands in the local Australian scene that I enjoy there are only a handful where the very mention of their name excites the hell out of me and long running South Australian death/doom outfit Mournful Congregation sit right at the top of that extremely short list, primarily because of their utterly jaw-dropping 2005 release, The Monad of Creation, but also through the more diverse follow-up release, 2009’s The June Frost. The Unspoken Hymns is a “short” five track release featuring tracks the band has recorded and released across a bunch of split albums over the years and, as such, isn’t exactly a “new” release in the strictest sense of the word but I can imagine many people (myself included) will not have heard the bulk of the material here anyway due to the limited availability of the original recordings so it is most definitely the next best thing to a new release while we await a fresh long player from the band (which isn’t too far away from what I understand). The two big highlights for me on this compilation are realised in the first two tracks, Left Unspoken, and The Epitome of Gods and Men Alike (which originally appeared on the Four Burials split and the band’s first compilation release, The Dawning of Mournful Hymns respectively) as they are tracks I’d never heard before and are exactly the kind of tracks I’d expect to hear from the band. Both Left Unspoken and The Epitome of Gods and Men Alike are dark and moody numbers played in a style perhaps more reminiscent of the band’s earlier Monad of Creation days as opposed to the slightly more open and adventurous sound they revealed on The June Frost in 2009 (which is perfectly fine with me I must say). As with all of their best material the tracks are driven by the interplay between the guitars. The band’s ability to allow the guitars to diverge melodically and then come back together again to play in unison without distracting from the overall feel of the piece is something that I’ve always admired about the band and these two tracks demonstrate that ability masterfully. The next two tracks (A Slow March to the Burial and Descent of the Flames) will not be unknown to fans of the band as they both appeared on The June Frost but the versions that appear on this release more accurately come from other, earlier, split releases (the split with Sabat Mater and the split with Stone Wings, respectively). The only real difference I could discern between these earlier cuts and the contemporary ones are that the production is different and that the length of each track is marginally shorter but musically they seem to me to be identical. For my money there wasn’t a lot to get excited about here simply because I already know the tracks but those who are unfamiliar are in for a treat. Rounding out the compilation is a cover of Elemental which was originally written by Finland’s Thergothon - another very highly acclaimed funeral doom band whose sole full length release, 1994’s Stream from the Heavens, is nothing short of legendary. As you would expect, Mournful Congregation do the song every justice it deserves and it’s great to hear the track graced with a louder and clearer production than was present on the original recording. Mournful Congregation really are one of the best doom acts going these days (and have been for some time just quietly). I would suggest that anyone out there who considers themself to be a fan of the genre and hasn’t heard the band before is really doing themself a disservice.